Slide into summer with Splashland. Parents can tick one activity off their school holiday to-do list as Splashland returns. 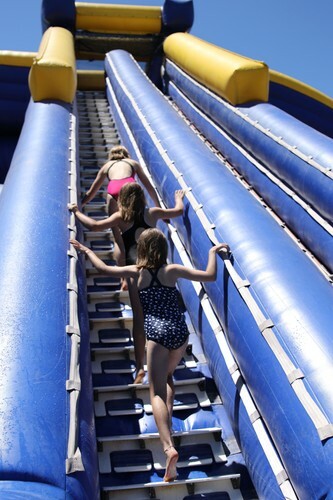 The towering 12-metre high Trippo returns so parents and kids can race each other down the 40-foot drop. The Reef obstacle course will keep the tweens entertained plus there’s new a smaller obstacle course for the tiny tots as well as the bouncy castle and seal pup slides. Bigger kids will get the heart pumping with The Launch Pad and challenge their friends down The Speed racer. With more rides for the big and little kids, food trucks, plenty of space to relax in between slides, and live music, everyone will have a blast at Splashland. Tickets on sale now via Splashland website. - Launch Pad: Two lanes of ultimate sliding action with a mid-slide bump that promises to get you airborne! Ages: Kids 5+ years old, teens and adults. - Crazy Maze: Let the little ones crawl, slide and tumble their way through the Crazy Maze. All of the action of the reef, but for the tiny tots. Ages: 3–5 years old. - The Castle: Enjoy a bounce with friends on The Castle this summer, with just enough splash to keep you cool. Ages: 3–5 years old. - Trippo: Three lanes, a 40-foot drop and 54m before a speedy, splashy ending. Trippo is the ultimate, safe, sliding experience. Ages: Kids 5+ years old, teens and adults. - The Reef: 40 metres of rolly polly, crawling and sliding fun. A slippery obstacle course for young adventurers. Ages: Kids 5–12 years old. - Speed Racer: Six lanes of super speedy sliding. Challenge your mates to a race to the bottom. Ages: Kids 5–12 years old. - Seal Pup Slides: Two splishy splashy slides for Splashland’s tiniest attendees to enjoy. Ages: Kids 3–5 years old and more. Non-sliding adults and children under 3 enter free.